The polypropylene (PP) pellets are melted and extruded into a film (extruded) to a specific density, or denier (a unit of measurement). The denier number dictates the strength and suitability of the yarn for any specific purpose- the higher the denier number, the thicker the fiber; the lower denier, the finer the fabric. 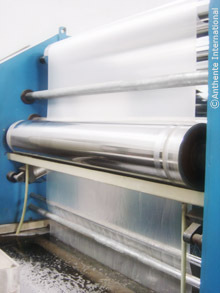 At Anthente, the PP yarn is extruded to the denier used in the production of bulk bags and FIBC products. Some of our clients purchase our yarn for the production of tarps, safety straps, and other consumer goods. Depending on your requirements, we can recommend and modify the denier number to suit your product.